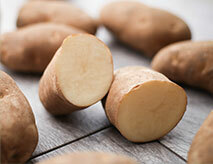 The White Russet™ potato is a better potato with reduced bruising and fewer black spots than typical Russets. 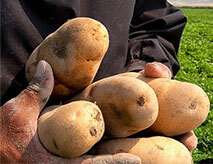 We’ve used proven modern biotechnology techniques to bring together some of the best traditional potato traits from different types of potatoes. The result is the White Russet™ potato. 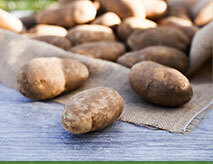 The U.S. Department of Agriculture (USDA) and Food and Drug Administration (FDA) have extensively reviewed the first generation of White Russet™ potatoes and found them to be just as safe and nutritious as other potatoes currently on the market. The plant biotechnology used in the White Russet™ potato creates a precise improvement of specific traits by silencing genes already present in the potato. 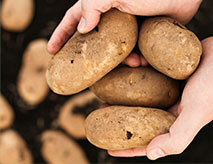 White Russet™ potatoes are farm-grown potatoes, bred with seed potatoes and traditional farming methods. They are improved versions of Russet Burbank and Ranger Russet varieties, with less bruising and browning and significantly less waste. White Russet™ potatoes offer a new choice in the marketplace with improvements in quality and environmental sustainability. 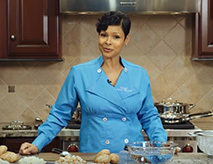 Celebrity Chef Nikki Shaw shares the benefits of White Russet™ potatoes and how they make the preparation of everyone's favorite potato dishes more convenient. Watch Video.